Download the new Pilot Flying J Travel Center app to score free drink deals every day this month! Pilot Flying J Travel Centers is celebrating the launch of it’s new app by offering free drink deals every day in April! Just download the app to get these deals. Valid through May 2, 2019. Here’s a fun summer treat idea! 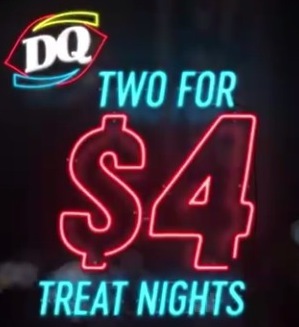 Stop by Dairy Queen for their Two for $4 Treat Nights! Dairy Queen is back with their Two for $4 Treat Nights! Stop by any participating Dairy Queen after 8PM to score two medium sundaes or two dipped cones for just $4. Starbucks Rewards Changes Start Today! Are you a Starbucks Rewards member? Don’t forget that these new Starbucks Rewards changes start today, April 16th! If you’re a Starbucks Rewards member, don’t forget that these changes start today! As a Rewards member, you will now be able to redeem your points at different levels for various items without being required to reach Gold Level to qualify! This is good news for some people, because it means you’ll be able to redeem your stars much more quickly for lower-priced items like a regular coffee! But if you love your more expensive handcrafted beverages, it will now take more stars to redeem for those freebie items. I personally think there’s still so much to love about the generous Starbucks Rewards program — and I’m kind of excited about the opportunity to redeem for merchandise and packaged coffee! Also, they’ll still be offering free in-store brewed coffee and tea refills, plus birthday freebies! 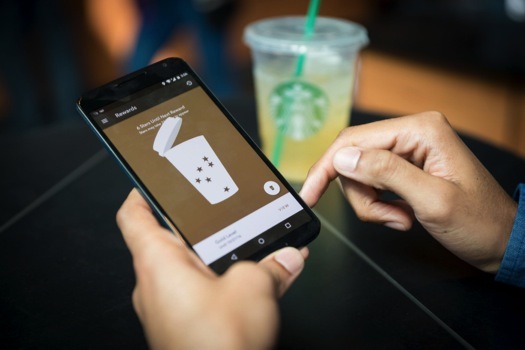 How do you feel about the new Starbucks Rewards changes? We’d love to hear in the comments! Psst! Did you see how this post on how to throw a Starbucks birthday party on a budget? SO cool! 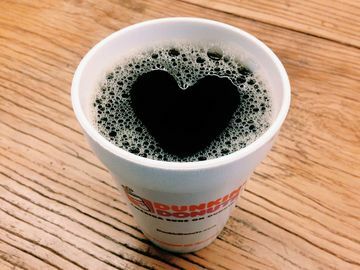 Dunkin’ Donuts: Medium Coffee only $1 Today! Stop by Dunkin’ Donuts to score a medium coffee for just $1 today! Dunkin’ Donuts Perks Members (free to sign up) can get a medium hot or iced coffee for just $1 today! Just scan your QR code found within the app to get this discount. Valid today only, April 15, 2019. Psst! Don’t forget to check out all the other Tax Day Freebies and Deals you can score today! Tax Day is almost upon us! Relieve some stress on Monday with these Tax Day Freebies and Deals! Tax Day is Monday, April 15th! To help ease some stress that often comes from Tax Day, many companies offer special freebies and deals for their customers! Once your taxes are all filed on Monday, don’t forget to stop by some of these restaurants to get some fun Tax Day Freebies! California Tortilla – Get a free order of chips and queso with any purchase when you come in and say “1040” when placing your order. 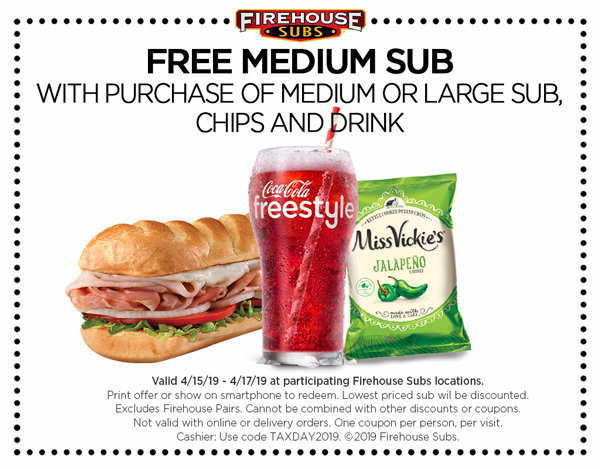 Firehouse Subs – Buy one medium Sub and a drink, get one medium Sub free! Just use this coupon on April 15-17 to get this deal. Great American Cookies – Get a free Original Chocolate Chip Cookie when you stop by participating stores on Monday, April 15th. Hardees– Customers can get a free Sausage Biscuit on Monday, April 15th, if you stop by between 7am to 10am. Hot Dog On A Stick – One free Original Turkey or Veggie Dog for all customers on Monday, April 15th. Kona Ice – Kona Ice will be giving away free Kona Ice to help people chill out and relax on Monday, April 15th. Potbelly Sandwich Shop – Mention that it’s Tax Day on April 15th to get Buy One, Get One Free Entrees. Schlotzsky’s – Get The Original Sandwich for free when you order a medium drink and chips on April 15th. BJ’s Restaurant – Get half off large Deep Dish or Tavern-Cut Pizzas on April 15th. Boston Market – Print this coupon to get a Half Chicken individual meal with two sides, cornbread and a drink for just $10.40 through April 15th. Bruegger’s Bagels – Get a Big Bagel Bundle (any 13 bagels and two tubs of cream cheese) for just $10.40 through April 15th! Limit one offer per person. 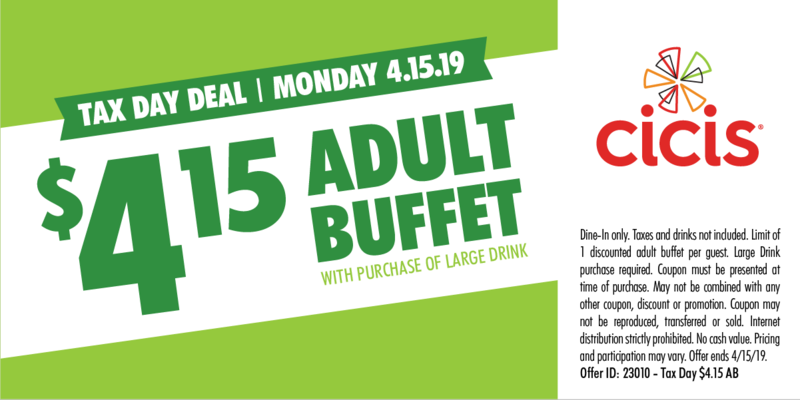 Cici’s Pizza – Purchase a large drink and get an adult buffet meal for $4.15. Just use this coupon on April 15th. Corner Bakery Cafe – Get two entrées for only $10.40 from April 15th-17th. Noodles & Co – Sign up for NoodlesREWARDS and receive $4 off online and mobile orders of $10 or more through April 15th. Smoothie King – Score $2 off any 20-ounce smoothie April 15th-18th when you download the Smoothie King’s Healthy Rewards app. And don’t forget that Office Depot is offering five FREE pounds of shredding through April 27th with this coupon. Do you know of any other Tax Day Freebies 2019 that we missed? Let us know in the comments, if so! 50 of the Best Freebies You Can Sign Up For Right Now! 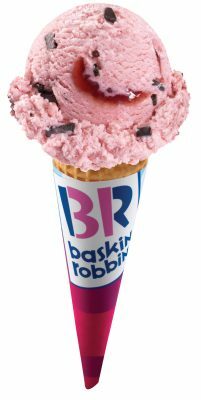 Get a free scoop of ice cream at Baskin Robbins! Download the Baskin Robbins mobile app to receive a free scoop of ice cream! Simply create an account and check the “deals” section for the coupon.